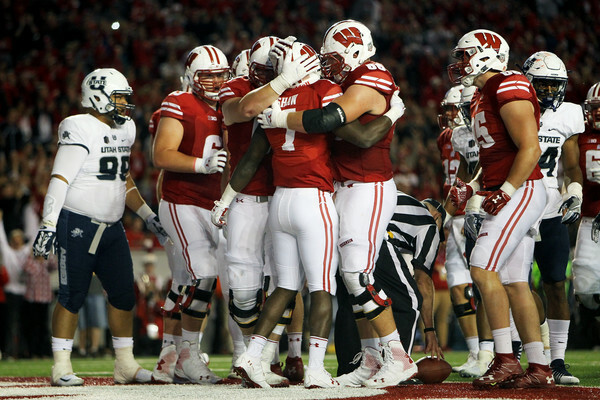 The Wisconsin Badgers opened the season with an emphatic 59-10 victory over Utah State. While it was not very attractive in the first half, the ninth ranked Badgers cruised to an easy win with a suffocating second half performance. Below are some thoughts, and observations noticed in the Friday night win. Was this performance just first game jitters? Did the Friday night lights play a role? Is the offense too predictable in the early stage of games? We are leaning to the fact it was the first game where timing can be an a bit off. It is unwise to make a conclusion based on a single game, but this is worth keeping an eye on to see if this trend becomes a mainstay as it did in 2016. 2. Jonathan Taylor has a breakout game – He is only a freshman, but a good one at that if this game was any indication. Taylor showed speed and the ability to keep the legs churning. He finished with 87 yards on 9 carries and a touchdown. It was an impressive showing and it never hurts to be running behind an offensive line that the Badgers typically employ. Continue to watch the progression of Taylor as he splits carries with Bradrick Shaw (84 yards and 1 TD on 18 carries) and Chris James (5 carries for 16 yards). 3. Scoring production was evenly spread out – The Badgers had 8 touchdowns against the Aggies. And 8 different players scored a touchdown. How about that for spreading the production around? Shaw, Taylor, Garrett Groshek, and Austin Ramesh provided the rushing scores. Troy Fumagalli, Quintez Cephus, and Zander Neuville had receiving scores as Alex Hornibrook had a highly efficient passing game going 15 for 23 with 244 yards and the 3 touchdown passes. The penultimate score was probably the most fitting. Joe Ferguson, grandson of current Wisconsin Athletic Director Barry Alvarez, returned an interception 99 yards for a touchdown. What a cool moment for Joe Ferguson, former walk-on/redshirt senior/Barry Alvarez’s grandson. 4. The defense rose to the occasion – Utah State had a strong start with 88 yards on offense and a 10-0 through one quarter. After that, the Badgers defense imposed their will. While many will point to the ejection of Utah State’s Jalen Davis as the turning point, this defense was hitting their stride about the same time and it is usually devastating for opponents when that happens. While the Badgers gave up 304 yards (219 passing and 85 rushing), nearly half of those came on the final three Utah State drives when the game was no longer in doubt. The Badgers forced 4 turnovers including interceptions on back-to-back Utah State drives to end the first half and start the second half. That led to a tie game at halftime and then a two touchdown lead early in the third. The most noticeable part of the defense was their hunger to keep the Aggies to only 10 points. They stopped the Aggies once on downs in the third quarter, then they had the pick six midway through the fourth quarter, and finally ended the game with a pass breakup in the end zone. This Badgers defense, despite the loss of Jack Cichy for the season, looks just as good as the defenses of the previous few seasons. Keep in mind that the Badgers are on their third defensive coordinator (Jim Leonhard) in as many seasons. Wisconsin will play at home next Saturday against Florida Atlantic. The game is scheduled for 12 PM Eastern Time on the Big Ten Network. The 2016-17 season came to an end for the Wisconsin Badgers with a 24-16 victory over Western Michigan in the Cotton Bowl. The Badgers came back strong after a tough Big 10 Championship Game loss to finish the season 11-3. We provide some thoughts on the Badgers season closing win below. 1. 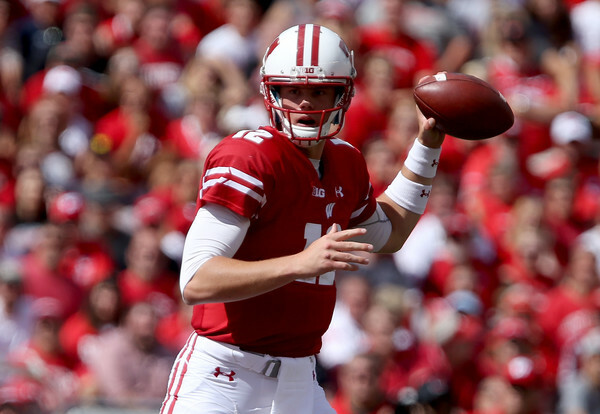 The Badgers get off to a hot start – Just like against Penn State, Wisconsin was able to get off to a hot start on offense with two touchdowns on their first two drives and racking up 163 yards en route to a 14 point cushion. Corey Clement started with 5 carries for 42 yards and a score on the first drive while Dare Ogunbowale ended the second drive with the final 21 yards and the touchdown. The Badgers finished the first half with an average of 7.1 yards per carry (22 carries for 156 yards). 2. The Badgers cooled off… Again – Despite hot starts the past two games, the Badgers slowed down and allowed both Penn State and Western Michigan back into the game. The Broncos went on a 16 play and 65 yard drive to cut the deficit in half and then held the Badgers to a field goal the rest of the half. A slow start by the Badgers in the second half saw the Broncos keep it at 17-10, but the Badgers stuck with their offense and trusted their defense. The Badgers finished the game with 184 yards rushing, just 28 coming in the final 30 minutes. 3. 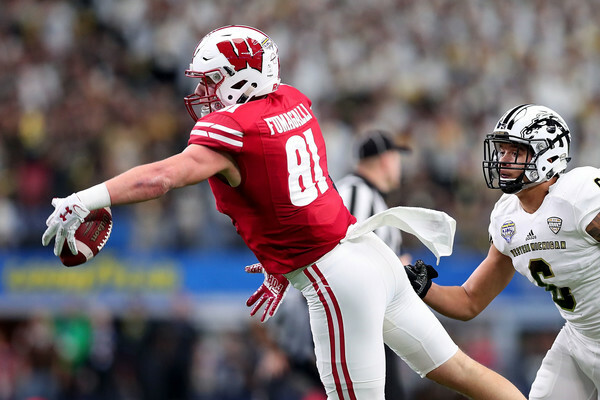 Fumagalli impresses – Troy Fumagalli, a junior, was not perfect in the Cotton Bowl, but he was, without a doubt, the star of the game for the Badgers. Yes, he dropped a sure touchdown in the first half, but he more than made up for it with acrobatic catches and one handers. He even had a big third down catch in the final few minutes to help extinguish hope for the Broncos and end a possible comeback. Fumagalli finished with 6 catches for 83 yards and a touchdown. Below are a couple of his gems. 4. The defense does its job – Wisconsin’s defense played a good game. T.J. Watt started with two first quarter sacks and they held Western Michigan’s star receiver Corey Davis to 6 catches, 73 yards, and the incredible touchdown catch below. The Badgers allowed 123 yards rushing on 31 carries for an average of 4 yards per carry. The Broncos never seemed in sync on offense and had 5 fumbles, but Western Michigan managed to recover all of them. The key late in the game was T.J. Edwards‘ interception at the WMU 12 yard line. That allowed the Badgers to pad their lead at 24-10. 5. The Seniors end on a high note – This senior class for the Wisconsin Badgers claimed the school’s first Cotton Bowl victory and also ended as the winningest class in Wisconsin history at 41. Quarterback Bart Houston got the start and had a quietly effective game going 11 of 12 for 159 yards. Corey Clement had 71 yards and a touchdown on 22 carries while fellow senior running back Dare Ogunbowale had 5 carries for 22 yards and a score along with 2 catches for 28 yards. The defensive seniors of Vince Biegel, Leo Musso, and Sojourn Shelton helped lead a stingy defense this year. The impact of each of those players will be missed, but the Badgers are hopeful for the players behind them going forward. The Badgers end the 2016-17 season at 11-3, which is their second 11 win season in the last three years. Wisconsin has now recorded 10 wins in six of the last eight seasons and have won three straight bowl games. Below are thoughts of each game the Badgers played in over the past season. There will be one a season long report card published in the next few weeks (midseason report card here). The Wisconsin Badgers suffered a heartbreaking 38-31 loss to Penn State in the Big 10 Championship game. They held a 28-7 lead late in the second quarter, but a defensive secondary meltdown saw them lose that lead in a hurry. 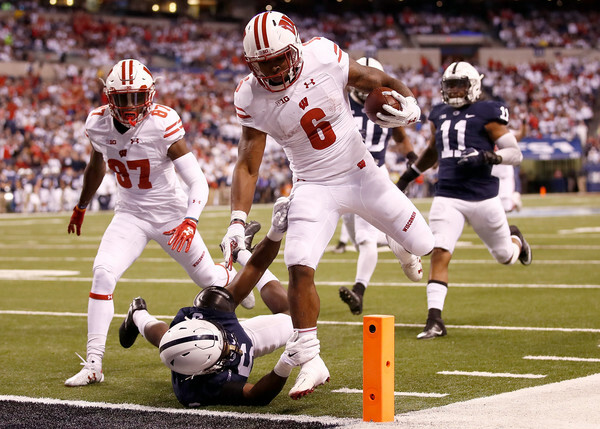 We look at the good from the Badgers as well as the bad against Penn State. 1. 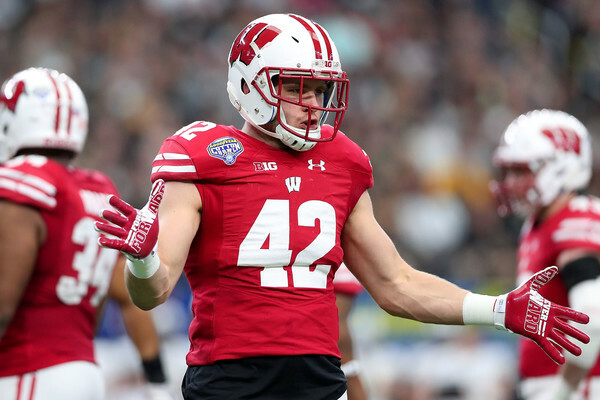 The secondary was terrible – There might not be an adjective strong enough to describe how terrible the defensive secondary was for the Badgers. Horrendous? Non-existent? Abysmal? Take your pick, but it was not pretty. They shoulder the lion’s share of blame for this loss. Deep pass equaled completion time after time in the second half for Penn State’s Trace McSorley (384 yards passing and 4 touchdowns). Lubern Figaro missed on a tackle in the second quarter that was Saeed Blacknall waltz into the end zone. The corners were burned off the line scrimmage to get easy separation. It was ugly. However, this was not unexpected. It was mentioned here and here in the last two weeks and the Badgers also struggled against Georgia State’s passing attack early in the season. The highest passing total allowed this season coming into this game was 277 yards against Northwestern. It was tough to watch, but now defensive backs coach Jim Leonhard has four weeks to fix it. And he might need every single one of those days depending on who the Badgers face in their bowl game. 2. Where will the Badgers land in the Bowl picture? – The Rose Bowl is out of the question now even if two Big Ten teams end up in the College Football Playoff. Bucky’s 5th Quarter has a great write up on where the Badgers may end up. One possible destination after this loss: Cotton Bowl against, presumably, Western Michigan. The Broncos are 2-0 against Big Ten teams in 2016 and they boast Corey Davis, one of the best receivers you may have never heard of. Did we say that the secondary needs some work? 3. The rushing attack was good, but not good enough – This sounds strange because they had 241 yards and 3 touchdowns in the game. The Badgers 115 yards rushing in 1st quarter (tied most in one quarter with the Akron game). 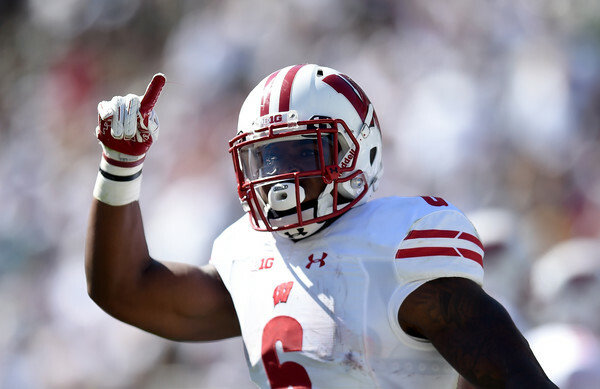 Corey Clement had 7.8 yards per carry (had 164 yards and 1 touchdown on 21 carries), yet the Badgers still lost. The team averaged 4.9 yards per carry. However, they failed to get a yard on 4th and one with a minute left to play. That is a play a Wisconsin offense, offensive line, and running back should make. It was a great start for the rushing attack, but it slowed down immensely in the final 3 quarters. 4. Penn State made adjustments, the Badgers did not – The Badgers were burned in the first half on passing, but it was overshadowed by the 28-7 lead they built. In the second half, the Nittany Lions kept throwing it deep, but the adjustment they made was giving McSorley time. The Badgers created havoc in the first half along the Penn State offensive line, but the pressure dried up in the final 30 minutes allowing Penn State’s speed and passing attack to flourish. 5. 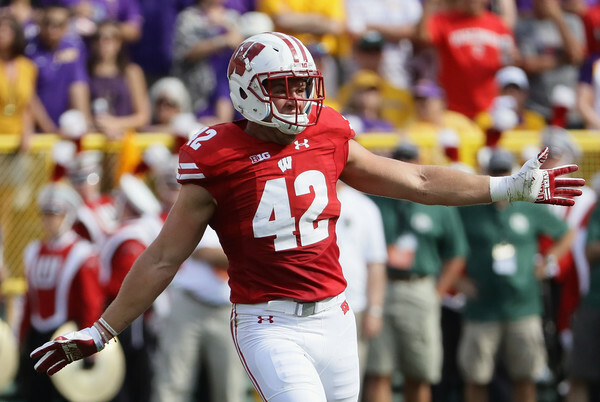 Paul Chryst gets conservative – The Badgers were cruising in this game 28-7 when the T.J. Watt forced and recovered a fumble. The first play after a turnover? A run for 3 yards. The Badgers then threw incompletions the next two plays and gave Penn State the ball back. The Nittany Lions scored on their ensuing drive. The Badgers still had a minute left in the first half after that touchdown, but opted to play conservative again. They ran the ball twice, completed a 3rd down pass, but then went back to the run to end the first half. Were precious points left on the board? Paul Chryst also opted to attempt a long field goal on their first drive of the second half with the unreliable Andrew Endicott. He missed a 48 yard field goal attempt and the Nittany Lions scored on the next play to make it a 28-21 game. 6. Houston played well, but could not get it done – Bart Houston played the entire game as Alex Hornibrook was held out of the game. Houston did well going 16 of 21 for 174 yards, but he succumbed to the pressure late. He missed a wide open Troy Fumagalli late in the third quarter that would have given the Badgers a lead of 35-28 instead of the 31-28 lead they ended up with. If that is converted into a touchdown, then that 4th and 1 late in the game is a field goal attempt to tie the game (though that is far from guaranteed with Endicott kicking the ball). There were also issues with holding onto the ball. He fumbled once in the middle of the third quarter and was lucky to get it back, but he also nearly fumbled a couple of other times. He does not get a ton of blame for this loss, but there were a few issues that stood out. Wisconsin finishes the regular season 10-3 and will find out on Sunday where they are playing their bowl game. Below are previous columns providing thoughts on each Wisconsin game this season. 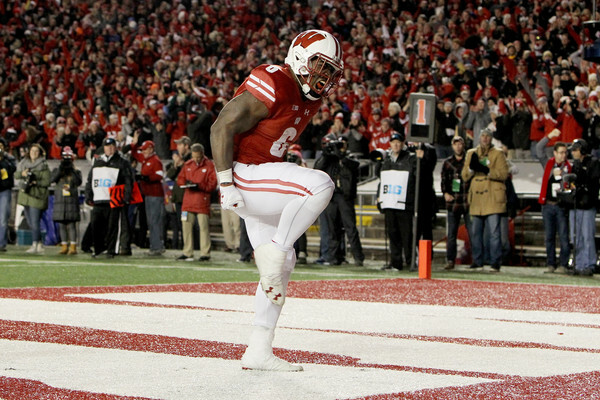 The Wisconsin Badgers needed a huge second half rally to defeat their rivals Minnesota 31-17. The Badgers came into the game knowing they had already clinched the Big Ten West with Nebraska’s loss against Iowa on Friday. The win keeps Paul Bunyan’s Axe in Madison for the 13th straight year and was the 20th win in the last 22 meetings between the teams. The series is now tied at 59-59-8. There were some good things from the Badgers (second half) and some bad things (first half). We will look at both the good and bad below. 1. Tale of two halves – The first half was terrible for the Badgers. Minnesota ran roughshod over Wisconsin’s defense while Mitch Leidner was able to do whatever he pleased. The offense was moved the ball during the first 30 minutes, but were plagued by drops. Jazz Peavy, Robert Wheelwright, Troy Fumagalli, and George Rushing all had pissed hit off their hands and fall incomplete. Quarterback Alex Hornibrook was knocked out of the game late in the second quarter after a big hit on the sideline The special teams even got in the act by giving up a big return that led to a touchdown. It seemed like the Badgers were letting their Playoff hopes disappear, but they trailed just 17-7 at the break. Then came the second half that put the Badgers back on track. The defense had four interceptions (with three of those leading to short fields for the offense), Corey Clement had 2 rushing touchdowns, the team looked way better, and Andrew Endicott even made a field goal (albeit barely inside the upright). They responded to their deficit with incredible resolve. For the game, Minnesota had 286 yards on offense (158 passing and 128 rushing). The Gophers went 3 of 14 on third down, had those 4 turnovers, and finished with 3.4 yards per carry. 2. The defense showed issues in the pass game – This sounds ironic considering the defense had 4 interceptions and the fact Mitch Leidner had only 9 completions. However, there were some problems especially in the first half. The secondary had issues against Purdue last week with receivers getting behind them. Well, that was an issue again this week in the first half. Luckily for the Badgers, the passes were dropped including one in the end zone by Drew Wolitarsky. The Gophers had 226 yards of offense in the first half with 115 of those coming in the air. Yes, the Badgers made the necessary adjustments, but they will be facing a more potent passing attack in Penn State next week that averages 251 yards per game passing. Another first half performance like that from the Badgers and they may not be so lucky to be down just 10 at halftime. 3. Alex Hornibrook’s health – Alex Hornibrook took a big hit on the sideline late in the first half and his head hit the ground hard, which led to him going back to the locker room. He did not return after that and now the most important question is will he miss any more time and if so, how much? Hornibrook’s health comes first and foremost and Bart Houston can lead the offense if Hornibrook has to miss the Big Ten Championship. It is hard to gauge the impact of Hornibrook missing time. The offense is run based and has been on a tear the last seven games averaging 230 yards per game on the ground. Both quarterbacks have been effective when they played. The downside to missing Hornibrook is Penn State potentially has to only focus on one quarterback instead of two. 4. Different ways to get the run game going – It goes without saying that the run game is key for Wisconsin. The Badgers are finding different ways to help the rushing attack. Last week it was screens (technically a pass, but it is really an extension of the run game) to Dare Ogunbowale, but those were not seen very much against Minnesota. Instead, it was end-arounds for Jazz Peavy (3 rushes for 83 yards) including a 71 yard run that set up Clement for his second touchdown. Peavy has been extremely effective (and efficient) this season in the run game with 180 yards and a touchdown on 14 carries (12.9 yards per carry average). What will it be next week? Straight power runs from Corey Clement? Bradrick Shaw with his speed and power? More fullback dives from Alec Ingold and Austin Ramesh? Will it be back to the screen game with Ogunbowale? Or will Paul Chryst just keep going back to the well with Peavy on the end around? It may end up being a full combination of all those and then some. The Badgers (10-2 overall and 7-2 in the Big Ten) will play next week in the Big Ten Championship game against Penn State. This will be the fourth time since the inception of the Big Ten’s Championship game that the Badgers will be in it. They previously defeated Michigan State 42-39 in 2011 and Nebraska 70-31 in 2012. They lost 59-0 to Ohio State in 2014. The game will be played at Lucas Oil Stadium in Indianapolis, Indiana with a kickoff of 8 PM Eastern time. Below are previous columns providing thoughts on each Wisconsin game this season. 1. The Special Teams were horrendous – It was not a good game for the Badgers’ special teams unit. Andrew Endicott went 1 for 3 on his field goal attempts including a terrible 32 yard miss on the first drive of the game. His 52 yard miss was more forgivable that was pushed just to the right of the post while his 36 yard make was just inside the post. He entered the game 4 for 4 on the season. The punting game was very poor as well. The Badgers had 5 punts and averaged only 30.2 yards per punt between Anthony Lotti and P.J. Rosowski. There was also the kickoff to Desmond King in the final 90 seconds of the game that was returned 77 yards and gave the Hawkeyes a chance to make it an uncomfortable finish. Special teams are where the hidden yards can be found and have a profound impact on the game in terms of field position. Let’s see how this unit improves against Nebraska next week. 3. Is there another quarterback switch on the horizon? 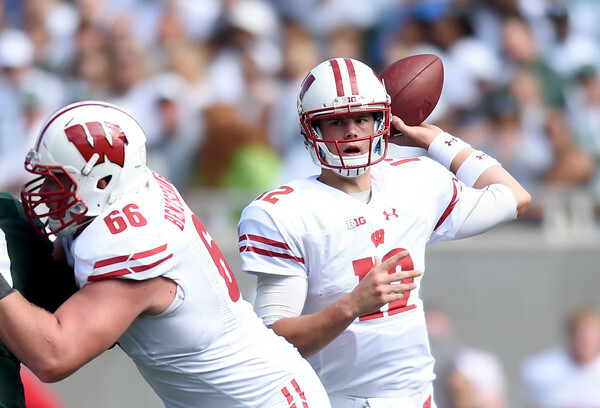 – This is a fair question because Hornibrook had some struggles. Early in the game he had a couple of questionable throws in the flat and did not always look comfortable. However, Hornibrook did not have a bad game and Houston played well in his limited action. Is Paul Chryst trying to throw a wrinkle for opposing teams? Or is there a real chance that he might switch quarterbacks? Against Iowa, the Badgers started off with a missed 31 yard field goal. Late in the second quarter, Corey Clement fumbled on the doorstep of the end zone that ended up resulting in a touchback, which Iowa converted into a field goal to make it a 7-6 game at halftime. The finished with a field goal late in the game to finish 2 of 5 on red zone touchdowns. The Badgers are now 15 of 28 (53.5%) in scoring red zone touchdowns and that percentage has only been going down the last few weeks. 5. The offense was both good and bad – We mentioned part of the bad with the red zone issues, but there was also the running game. The Badgers were not good running the ball. As a team they had 48 carries for 167 yards to produce a 3.5 yards per carry average. The offense was averaging 2.9 yards per carry until Corey Clement broke 34 yard run late in the game. Clement finished the game with 35 carries for 134 yards and a touchdown (plus that fumble on the goal line). This still is not the type of Badger rushing attack that we are accustomed to seeing. The receiving duo of Jazz Peavy (3 catches for 26 yards) and Troy Fumagalli (2 catches for 38 yards and a touchdown) were held in check for most of this game, but others did step up. The good part of the offense was the passing attack and it did not really matter if it was Bart Houston of Alex Hornibrook throwing the ball. Hornibrook hit Kyle Penniston for 54 yards thanks to a missed tackle, but he also had a nice ball over the top to Quintez Cephus for 57 yards. Houston went 4 of 6 for 59 yards and a touchdown while he looked crisp running the offense. There was also Dare Ogunbowale out of the backfield converting three big third downs through the air. He finished with 4 catches for 51 yards and only 2 rushes for 10 yards. All those small yardage runs helped the passing game to get open, but did it really feel like a typical Badger offense? 6. The defense gets back to Badger Ball – The defense has been really good at not allowing touchdowns. They have given up only 8 touchdowns all year and the red zone defense has seen them give up only 7 touchdowns on 16 attempts. Against Iowa they were stout again giving up just three field goals including one that was pushed out of the red zone. The defense allowed only 2 of 13 conversions on third down for the Iowa offense and 83 yards rushing (3.1 yards per carry for Iowa’s rushing attack). This bend, but do not break philosophy has been the backbone of the defense and propelled the team to their 5-2 record. 7. Defense misses out on possible turnovers – The defense played a very good game, but we can still lament about the missed turnovers. On Iowa’s first two drives of the second half there were three fumbles by the Hawkeyes. Yet, the Badgers failed to recover any of them. This is the only real gripe against a unit that is continually leaned on to carry the team. Wisconsin is now 5-2 overall and 2-2 in Big Ten play. They have a massive game at home next week against the Big Ten West leading Nebraska Cornhuskers. The Badgers need a win next week as well as another Nebraska loss to take control of the division. Below are previous columns providing thoughts on each Wisconsin game this season.